Chinese Premier Li Keqiang's first official visit to Cuba, coming hard on the heels of Japanese Prime Minister Shinzo Abe's visit to the island country, aims to deepen political trust and cement the traditional close relations between the two socialist nations, analysts said. In the first visit by a Chinese premier since the two countries established diplomatic relations 56 years ago, Li pledged to "inject a new dynamic in [bilateral] relations," Cuban state media reported. 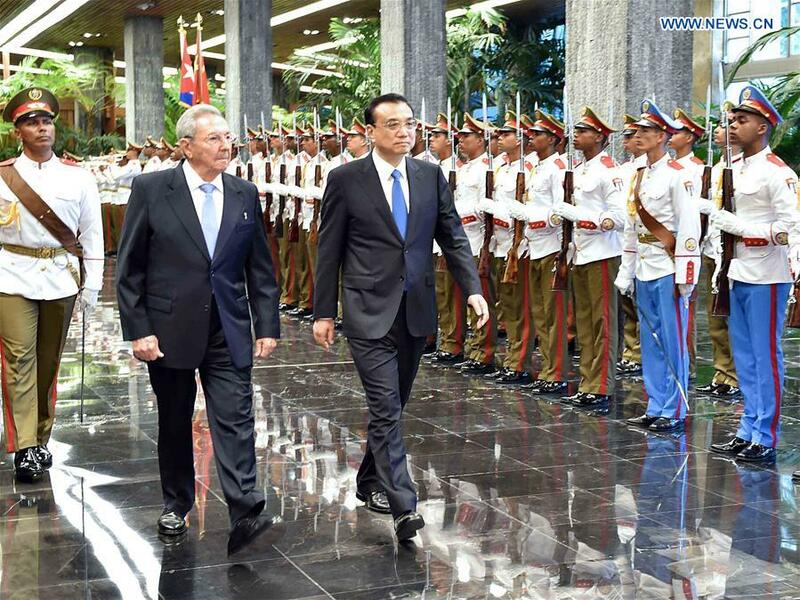 Li on Saturday met with Cuban President Raul Castro at the Palace of the Revolution in Havana. The two countries signed over 20 intergovernmental agreements and business contracts in various fields, including economic, technology, finance and information communications. The contracts also cover industrial capacity cooperation, new energy and inspection and quarantine. Li said that China wishes to retain close high-level contacts with Cuba and strengthen the two countries' communication in international affairs. "I'm looking forward to deepening the two countries' traditional friendship, enhancing pragmatic cooperation, increasing people-to-people exchanges and working together and promoting cooperation at a critical time for both countries, so as to carry forward China-Cuba relations on a higher level," Li said. Li made the comments at a welcome ceremony attended by Miguel Diaz-Canel, Cuba's first vice-president of the councils of state and ministers, and other senior officials, the Xinhua News Agency reported. "China and Cuba have withstood severe tests in the past 50 years during the US economic embargo against Cuba," Wang Youming, president of the Institute of Developing Countries, told the Global Times on Sunday. Wang said the two countries' relations are "firmly based on the same political ideology, and are unlikely to be affected by other external factors." Almost two years ago, Havana and Washington announced a detente after decades of hostility. China has in the past stressed that the normalization of US-Cuban relations would not pose any threat to China. Liu Yuqin, a former Chinese ambassador to Cuba, told the Global Times that Li's Cuba trip shows staunch mutual support from both countries to each other, in both their right to choose their own path and in ideology. Cuba is striving to upgrade its economic model, Diaz-Canel said at the welcome ceremony, expressing his hope that China would continue to participate in Cuba's social and economic development, according to a statement on the website of the State Council, China's Cabinet. "In addition, China also needs Cuba to open the Latin American market, given Havana's great political influence in the region," Wang Chong, deputy secretary general of Beijing-based think tank the Charhar Institute, told the Global Times. Li's visit came just a day after Japanese Prime Minister Shinzo Abe's two-day visit to Cuba from Thursday to Friday. "Japan may wish to gain Cuban support in the UN for a permanent security council seat," Wang Youming said, adding that the back-to-back visits demonstrate the competition between Japan and China on the global stage. Abe, the first Japanese prime minister to visit Cuba, announced a donation of medical equipment worth 1.27 billion yen ($12.6 million) during a news conference on Friday, Nikkei Asian Review reported. Abe said Japan would offer Cuba debt relief worth 1.2 billion yen of a total of 1.8 billion yen, as the debt had "long constrained [the Japan-Cuba] relationship." Some of the relieved debt would become financing for development projects that could involve Japanese companies, the report said. "Given the contracting global market, Japan is competing with China for market share in Latin America and the Caribbean," Wang Chong said. "Competition is inevitable because both the Japanese and Chinese economies are export-oriented and it should be taken as a signal of China's rise." "Japan is trying to divide some countries that keep close ties with China by drawing them to its side," Liu Weidong, a research fellow at the Institute of American Studies of the China Academy of Social Sciences, told the Global Times. Abe met with former Cuban leader Fidel Castro on Thursday, and called for "a strong and unified international response to North Korea's nuclear program," Reuters reported on Friday. But experts said this does not mean that Havana would get involved in the North Korea nuclear issue, noting that the focus of Japan-Cuba relations is economic cooperation.